NOTE: Zolan has passed ownership onto Harven for future updates. This addon automatically repairs your damaged gear when you visit a vendor. What makes this stand out from the others? Can be set to repair all items. Fits together with Zolan's other addons. This app does what I want it to. It was intended to be simple and do its job well, which I think it does. Here are ideas that, if I get enough requests for I may add. Automatically use repair kits to repair your gear while you are adventuring. Post a comment if you have another idea. Keep in mind that this is a repair app. It is only ever going to do repairs. If you want something else, send me a private message and I'll see if it is something I'm interested in doing. choekstr - 11,000 gold! Yeah... The comma is in the right place. At one time this was the largest donation out there. Since then Awesomebilly got a donation for 15,000 so now I await a rich fan to make me #1 again. Aside from the donation choekstr has given me tons of ideas for features to add to my addons as well as inspring a couple addons. Guardianrule - 500 gold! My very first donation I ever received. Sooooo nice to be appreciated for the amount of time I've put into making my addons for you guys!!!! ironllama - 500 gold! And another! You guys are friggin' awesome! Makes me feel like addon writing is worth it and helping people! jchudz - 500 gold! And another! Really happy that people enjoy my work! luizterra23 - 2,000 gold! And another! I am a happy man! Greiger - 2,000 gold! Just when I thought the well was dried up... WOOOOOOOOO!!! Who is Zolan thankful to? This isn't everyone that has helped but this is the major players that I'd like to call out. The Arcane Scripters Guild - These guys are amazing. Too many to list them all specifically. I love being able to be part of the gang. Thanks guys! Seerah - For various libraries, and ZAM Notebook which is an amazing tool for many reasons. Oh, and generally being a guru. Iriel - For going out of his way to teach me about the more obscure parts of Lua. choekstr - Repeatedly insisting that I add repairing to my Junk Handler addon. YOU - That's right. Thank you for using the addon! Seeing the number of downloads and favorites encourages me to do more work. All of my addons are intended to be used together, so if you like one, you might want to install others. Here's the list. Zolan's Chat Notifications - Makes audio queues on incoming chat that you don't want to miss. It is extremely configurable. Please give it a try. Zolan's Junk Handler - Handles nearly everything you could hope for when it comes to junk. Including, tracking user junk marking and repeating it. Marking certain things like ornate items or 'icky food'. Then selling all junk upon visiting a vendor. It even has the ability to destroy junk under certain conditions. You really should give it a shot. It is, in my biased yet honest opinion, a pretty darn good addon. 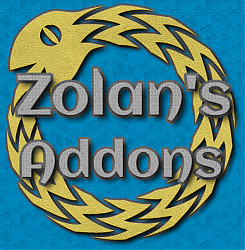 Zolan's Auto Repair - Automatic repairing of your gear upon visiting a vendor. Zolan's Slash Commands - A couple handy slash commands for doing stuff. Zolan's Anchors Away - Blocks that annoying 'Too many anchors processed.' error. It is kind of like cold medicine. It doesn't fix the problem, it just makes the symptoms go away. If you have ideas of features you'd like to see added, post them in the comments. I keep my addons very specific so any ideas will need to be along the lines of marking stuff as junk and/or auto selling stuff. If you have an idea for a 'hopefully' simple quality of life addon you'd like added to my suite send me a private message on the site. Keep in mind that I prefer my addons to do one thing and do it well. Changed items link style to default, thanks BigMons. Updated LAM-1.0 to the patched version - thanks Garkin! Updated for the new API changes. Updated LibAddonMenu to fix 2 small submenu issues. Nothing too exciting. I revamped the config screens of my 3 biggest addons (the other 2 tomorrow probably). They had been taking up a ridiculous amount of vertical space and the thought of adding more features and making that list made me sick. Now they are much nicer. Check 'em out. You can switch now to account wide or character specific settings. Repaired . Condition was 99% and cost 2 gold to repair. It doesn't show the item name, just empty brackets color coded to the item quality. Not a big deal really, just letting you know. I also use pChat if that makes any difference. I was able to fix this locally. I learned from comments in the MailR addon that bracketed links were changed, back in November I'm guessing. I had this issue in Wykkyd Auto Repair too, which is why I changed to Zolan's Auto Repair. 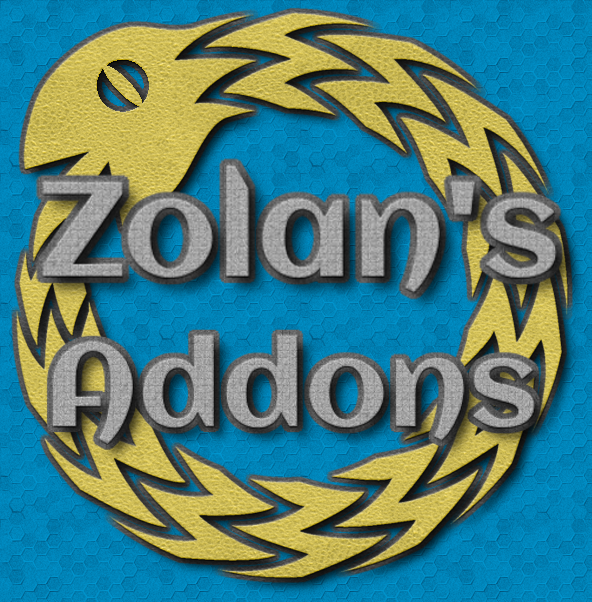 I was able to correct it in Zolan's Auto Repair addon by changing LINK_STYLE_BRACKETS to LINK_STYLE_DEFAULT in the Zolan_AR_Repairer.lua file located at C:\Users\NAME\Documents\Elder Scrolls Online\live\AddOns\Zolan_AutoRepair on my machine using the North American version. The item names aren't bracketed anymore, but it now shows the names of the items and they are still clickable links. You can try the same to fix this in your local version of the addon if you are using it. Last edited by BigMons : 01/25/16 at 09:58 PM. ATTENTION ALL: I have set up an Author Portal for myself and my addons. It has a place to submit bugs and whatnot. I would ask you to post bugs and feature requests there from now on. Thanks, and thanks for using my addons! !